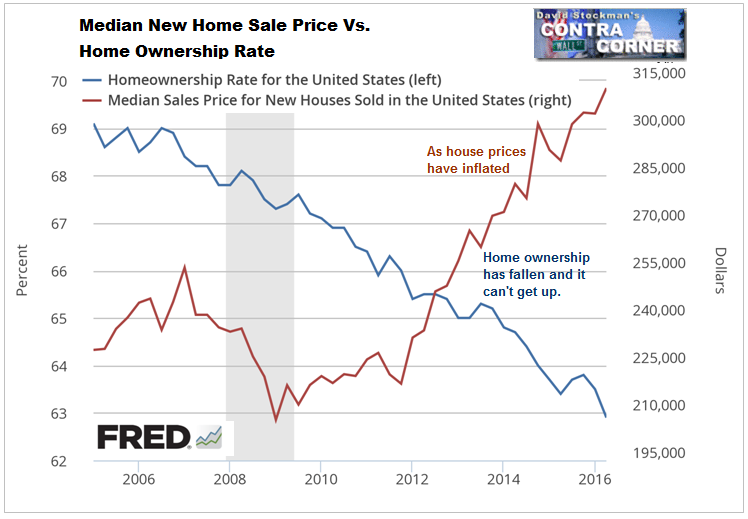 Sucker Punch On Main Street - Disturbing Facts About The Fed's Phony Housing "Recovery"
Whether you think there has been a housing “recovery” or not is a matter of perspective. Sales are indeed up 117% since the 2010 low, but that low was literally the worst level in the history of this data (since 1963) as a percentage of population growth. It was the Great Depression of Housing, the only possible result of the greatest housing bubble since the 1920s, if not in history. While sales have rebounded since that low, the current sales rate has barely recovered to the levels seen at the recession lows of 1991 and 1982. This rebound is little more than a dead cat bounce after 6 years of recovery, and now it may be faltering. Mainstream economists give the Fed credit for stimulating this “recovery.” But, in fact the Fed has created a Catch 22 with no way out. The only thing the Fed has stimulated is house price inflation while destroying interest income on savings for millions of ordinary Americans, especially former middle class retirees. With mortgage rates pushed down to all time lows, house prices have consequently inflated at a rate that offsets the buyer’s savings in the interest component of the mortgage. Meanwhile American savers have lost not only massive purchasing power, but also have been forced to consume principal. The Fed has not stimulated sales but it has succeeded in transferring wealth away from those who can least afford it to those who least deserve it. Had mortgage rates stopped falling at higher levels, house price inflation would have been stunted. More of a buyer’s mortgage payment would have been apportioned toward the higher interest component of the payment and less toward inflating the purchase price. But the Fed got the result it intended. It wanted to inflate prices to save the banks from their stupidity and criminality. Decisions were made at the highest levels of the Fed and the Federal Government to not only let the banks off the hook, but to rescue them. The only way to do that was to forego prosecution of massive criminal wrongdoing, and to engineer price inflation, so that the criminal perpetrators of the fraud that drove the Great Bubble would be free to re-offend. The Fed’s claim of trying to help the typical consumer is hogwash. The benefits of the low interest rate policy have flowed only to the upper income strata. 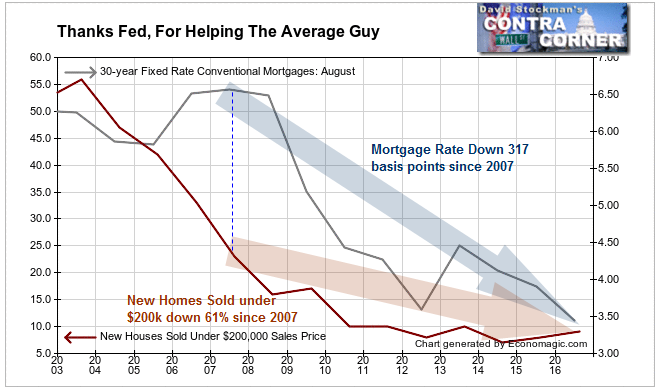 In our monthly updates of our “Thanks Fed For Helping the Average Guy” we see that the chance of the “average guy” to buy a new home remains virtually nil. Not only has there been no recovery in homes priced under $200,000, sales in that price range have essentially disappeared in spite of the world’s major central banks pushing mortgage rates down. Builders no longer have any interest in producing product in that price range because demand has weakened so much at that level. People at the reported median US household income simply can’t afford to buy houses regardless of the fact that they may be borderline qualified. Prior to the housing crash, most new homes sold were in the under $200,000 price range. Since 2007, mortgage rates have been cut nearly in half. Yet production and sales of homes in the under $200,000 range have continued falling, now down 61% since 2007. If monetary policy were helping the housing market, the rate of homeownership should be at least stable. 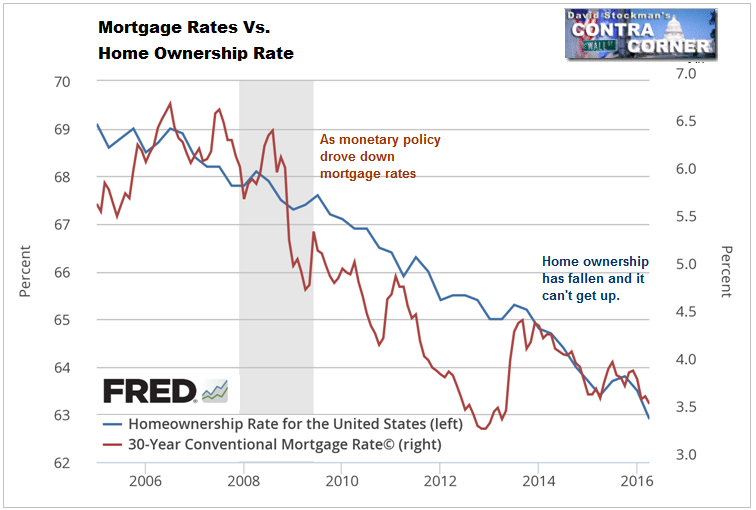 Instead, as mortgage rates have been consistently suppressed since 2007, homeownership has fallen concurrently. The problem is that as the Fed and its cohort central banks have been busy pushing down long term interest rates, that has pushed house prices up so fast that there has been no increase in affordability. During and after the 2007-2010 crash, homeownership fell due to the massive increase in foreclosures. The foreclosure crisis began to recede in 2012. Since then the drop in the homeownership rate has not been because of people losing their homes, it has been because fewer people can afford to purchase, even in spite of the world’s central banks subsidizing buyers with absurdly low interest rates. As we’ve shown, the subsidy is self defeating. It does not benefit buyers. Meanwhile, the only US regions that have seen any rebound at all in new home sales have been the West and Southwest. The Northeast and the Midwest remain absolutely dead in the water. In the Northeast, sales are down 60% relative to the 1991 recession low. Let that sink in for a moment–not versus the bubble peak, but since the low of a recession 25 years ago, when the US population was 25% less than today. 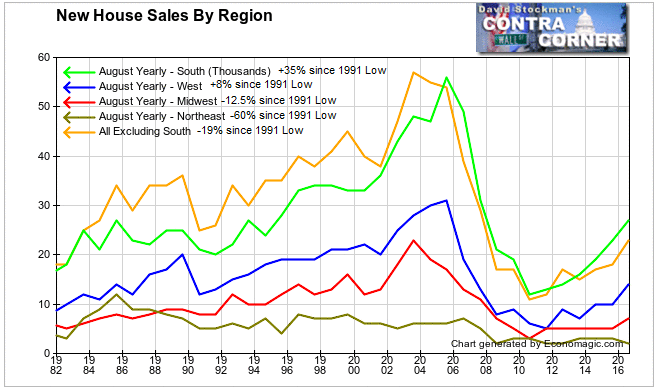 Sales in the Midwest are down 12.5% since the 1991 low. Lest you think that the West is going great guns, its sales are only up 8% since 1991. That is in spite of US population growing by 25% in those 25 years. The West has grown even faster– 45% since 1991. The issue in the West is an ever growing affordability crisis. It too is largely driven by the central bank interest rate subsidy of the past 8 years. It has reignited a massive housing bubble throughout California, the nation’s largest housing market. Tiny 3 bedroom bungalows in the suburbs of San Francisco now go for more than a million dollars. Absurd. Finally, the South has seen a surge of 35% in new home sales since 1991. But that’s is less than half the population growth of 72%. A long term demographic-geographic shift drives growth in the South. This trend has gone on for decades. Fed policy has nothing to do with it, other than to inflate prices. Notably, even after recovering from the 2007-09 crash, all regions remain well below the levels of the 2001 recession low. The argument that the Fed policy of ZIRP and suppression of long term interest rates through QE bond purchases has stimulated housing simply does not hold water. It has stimulated house price inflation, and that price inflation has fully offset the cost-reduction effect of the interest subsidy to home borrowers. At the same time Fed policy has cost millions of savers trillions in interest income that could have boosted not only consumption, but also cash available for down payments on home purchases. The idea that low interest rates stimulate the economy by stimulating housing is The Big Lie. The Fed has created a situation where the housing industry is so dependant on the massive interest rate subsidy that any uptick in rates is likely to cause a cataclysm. The Fed and its cohorts are responsible for this mess. They have left themselves, and us, with no way out.